Now that 2018 is here, we used the News Dashboard SEO tool to take a look back at 2017, to find out which publishers made the Top 5 most visible for Google News, the News Boxes in the desktop SERP (search engine results pages), and the mobile News Boxes for the keyword “donald trump” in the mobile SERPs. As publishers are seeing more signs that reaching readers through social media could become more difficult or even impossible, search and especially Google and its news-specific ranking types are an attractive way to help your journalism reach more people. We used the News Dashboard to uncover the Top 5 publishers by Google News visibility in 2017. Honorable mention (6th-10th in overall visibility in this ranking type): USA Today, Bloomberg, LA Times, Forbes, BBC News. There was only one change compared with 2016: Fifth-place USA Today dropped out of the Top 5, and was replaced by ESPN, which then moved ahead of Reuters. 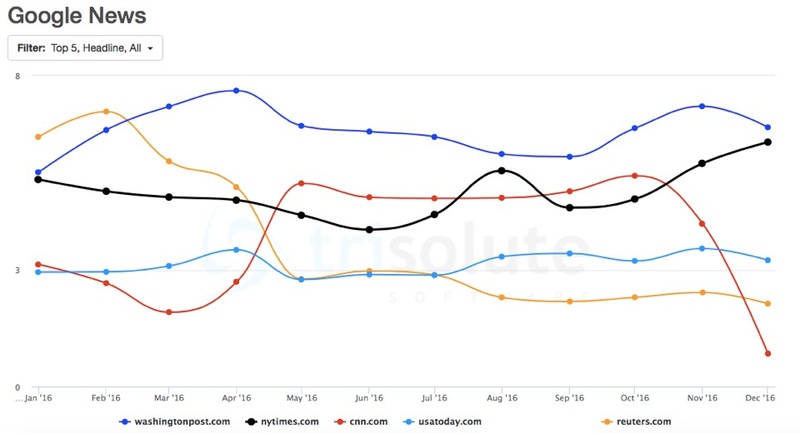 Cnn.com’s ranking drops severely in the last months. Moving over to desktop News Boxes, which are a news-related ranking type in the Google desktop SERPs, the Top 5 publishers by visibility for 2017 are listed below. We also went one step further using the News Dashboard, and looked at each of the publisher’s Top 10 most visible keywords for their month with the highest visibility in this ranking type. We used the News Dashboard to uncover the Top 5 publishers by desktop News Boxes visibility in 2017. Honorable mention: Yahoo, USA Today, Fox News, Reuters, The Verge. There was quite bit of movement in desktop News Boxes compared with 2016. 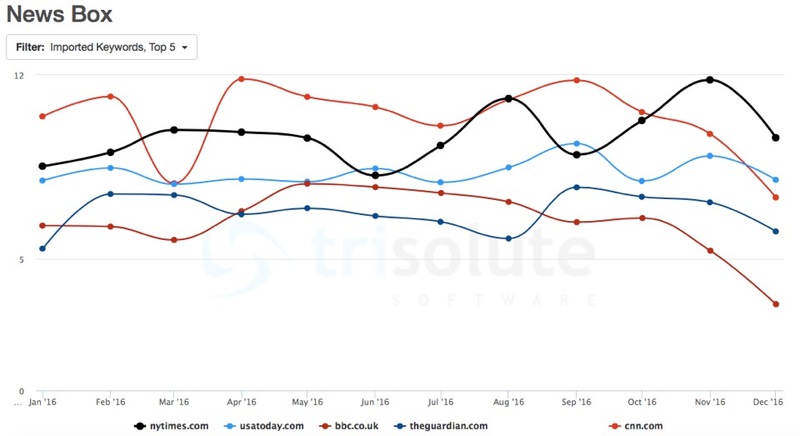 While CNN and NY Times repeated their top showing, ESPN and the Washington Post pushed out USA Today and BBC News, respectively, and the Guardian made its way into 4th place. Nytimes.com reaching the top as the year passes. We used the News Dashboard to uncover the Top 5 publishers visibility for the keyword “donald trump” in the mobile News Boxes in 2017. Easily the biggest overall news topic in 2017, there are no big surprises in the Top 5 most visible publishers for this keyword over the course of the year. While the Top 5 are powerhouse national news brands, there’s a bit more of a varied group in honorable mentions, including a couple news-magazine-style publications (with longer, analysis articles), a business-focused website and a politics-only website. Honorable mentions: Slate, USA Today, The Atlantic, CNBC, The Hill. We hope you found this year in review data for 2017 interesting. Stay tuned for more analyses – and a complete tool and website redesign – from the News Dashboard in 2018. And if you want to see Mobile News Box and Publisher Carousel data – including AMP Carousels – sign up for a News Dashboard demo today.